On Sept. 13, 2013, Kesean Smalls, 13, and Jahniel Hinds, 12, were playing tag on a street in New York City's borough of Brooklyn when an officer approached the children with his gun drawn. "Motherf—ker, get on the ground!" Capt. Brian McCaughey, 37, yelled at the kids. Jahniel ran and hid behind his mother. Kesean was cuffed and grilled by McCaughey, the New York Daily News reports. Thankfully, Jahniel's mother, Corinia Sivers, intervened, and the officer realized that he was some four blocks away from where he should have been. "I was just hoping that the [cop] didn't pull the trigger," Kesean's grandmother Yvonne Smalls told the Daily News. "I didn't even ask, 'What did he do?' because Kesean has always been a nonconfrontational kid. It was more a matter of, 'Why are you doing this?' "
After a two-year fight for justice for the boys, it was announced that McCaughey, who was a lieutenant at the time of the incident, will lose 30 days of paid vacation after pleading guilty to improper use of force in a departmental trial that was investigated by the Citizens Complaint Review Board. 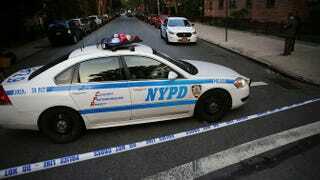 The decision must be approved by New York City Police Commissioner Bill Bratton, the Daily News reports. "Pointing a gun at two young boys, who had done nothing other than play tag on their own street, was a reckless use of force that traumatized them and created an extremely dangerous situation," CCRB Executive Director Mina Malik told the Daily News. According to the newspaper, the sentence was strongly protested by McCaughey, who found 18 vacation days to be a proper sentence. The Captains Endowment Association union president argued that the stiff penalty was proof of CCRB bias. "It also reveals their true bias against anyone wearing a uniform and their need for public floggings at the expense of due process of rights of officers," union head Roy Richter said. Sivers told the Daily News that even after the officer drew his gun on her son and his friend and shouted obscenities, the case could have been resolved if anyone from the police force had simply said sorry. "I asked for an apology because I know that mistakes happen, but they never did," the 39-year-old mom told the Daily News. "All they were doing was running and playing tag."